Reblogged from Elliptical Answers to Why Winter Mornings Are So Long – NYTimes.com by John O’Neil. As the parent of teenage boys who have to be dragged out of bed on school days, I had been looking forward to earlier sunrises once the winter solstice was past. But early January mornings seemed darker than ever while at the same time, the sky was clearly lighter around 5 p.m. FIGURE 8 An analemma shows the Sun’s varying positions over a year. It turned out that what I suspected was actually true — by Jan. 2, there were 12 more minutes of sunlight in the afternoons, but 3 fewer minutes in the morning. It also turned out that the reasons for it were complicated, as I discovered in a series of phone and e-mail conversations with Jay M. Pasachoff, a professor of astronomy at Williams College, and a former student of his, Joseph Gangestad, who received his Ph.D. in orbital mechanics from Purdue. They pointed me to the Equation of Time, a grandly named formula relating to the fact that not all days are 24 hours, if you track noon by the position of the Sun instead of on a clock. We’ve all seen a readout of the Equation of Time, Dr. Pasachoff said. 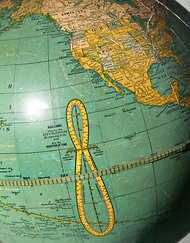 It’s that uneven figure 8 that can be found on globes in a deserted part of the Pacific, a shape known as an analemma. If Earth’s axis were perpendicular to its orbit instead of tilted, and if its orbit were a circle instead of an ellipse, the Sun would appear in the same spot in the sky each day and clocks and sundials would always match. Instead, they can be as much as 16 minutes apart, and that’s where things get complicated. As Earth moves toward winter solstice, you have “different things going on at the same time,” Dr. Pasachoff said. Earth’s tilt means that every day during the fall, the angle at which we view the Sun changes. It appears farther south and travels a shorter arc across the sky, affecting sunrise and sunset equally, and making the day shorter. The changes in the solar time follow a different cycle. In the early 1600s, Kepler discovered that planets move faster at the part of their orbit that is closest to the sun, the perihelion. For Earth, perihelion comes a little after the winter solstice, so from November on, Earth is accelerating. That increased speed means we reach the Sun’s maximum a little earlier each day, which pushes solar noon backward against clock time. That shift is amplified because the Sun is traveling a little south each day, while clocks only count its east to west traverse. Add it all together and you get sunrise and sunset times that are not symmetrical. In the weeks before the winter solstice, sunrise is being pushed later by both the changing angle of the Sun and the slowing of solar time. But sunset is being pushed in both directions — earlier by the Sun’s angle and later by the change in solar time. The result is more darkness in the morning and less in the afternoon. That’s why the earliest sunset of 2012, at 4:29 p.m., in New York fell as soon as Nov. 30, according to theNational Oceanic and Atmospheric Administration’s solar calculator, while mornings continued to stay dark later. After the solstice, Earth continued its acceleration until reaching perihelion on Jan. 2. So the sunrise continued to slide, reaching its latest point, 7:20 a.m., on Dec. 28. There it stood until Jan. 11, when we finally got another minute of morning light. By Feb. 7, sunrise will be all the way back to 7 a.m.
“It’s hard to wrap the mind around this problem, which is really a figment of our timekeeping system,” Dr. Gangestad said. That is, we would never notice it if we all just used sundials.